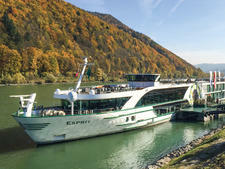 A cruise on Tauck's ms Emerald is as much about the destinations as it is about the ship (thankfully, both are excellent). 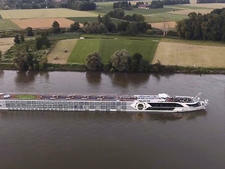 The ship is designed to sail the shallow and fluctuating French waterways of the Rhone and Seine rivers, and it brings passengers to incredible locations in comfort and luxurious style. Emerald is beautiful without being ostentatious. The ship's public spaces and cabins include impeccably maintained polished marble and brass features, along with glass and crystal light fixtures. Emerald was completely refurbished in 2017 in large part to reduce the number of passengers onboard while introducing a new, large cabin category; cabins on Deck 2 were revamped, growing from 150 square feet to 225 square feet. The refurbishment also brought with it Arthur's, a casual restaurant named for Tauck's chairman, Arthur Tauck. The cruise line/touring company has mastered destinations, too, providing a comfortable and fascinating experience in which passengers don't have to lift a finger if they don't want to. Most journeys on Emerald start with a land-tour option, which begins with transportation from the airport to a hotel -- all arranged by Tauck. The land option gives passengers a chance to explore cities like Paris, London or Monte Carlo, and Tauck arranges a mix of organized activities and time on your own for exploration. Effortlessness is perhaps the defining characteristic of a cruise on Emerald. Everything a passenger needs has been planned for, and service is exceptional: friendly, intuitive and fast. And everything is included, from drinks to tips and shore excursions. This is the perfect cruise for someone who doesn't want to worry about any planning once it begins, the traveler who wants to show up and have everything taken care of. While passengers can skip the ship's planned activities, most don't, which can be tricky for people who like to venture off on their own occasionally. It's even likely that other passengers will comment out of concern (or curiosity) if someone skips a cruise ship excursion. (With 98 passengers -- compared with 150 to almost 200 on other cruise ships and lines -- those sailing on Emerald tend to bond quickly.) 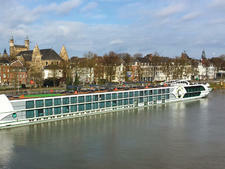 Emerald is ideal for travelers who want to explore without any hassles. Passengers on Emerald are primarily Americans over 60 years old and often closer to 70. They tend to be well heeled and well traveled; they know what they want and aren't afraid to ask for it. They've also likely had experience with guided travel. 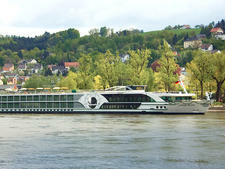 In fact, many passengers have traveled with Tauck before, either on another cruise or as part of the company's land travel branch. A number of solo travelers sail on Emerald as well. 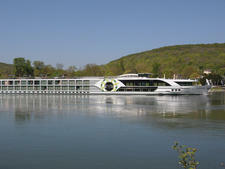 Emerald offers several family sailings in the summer as part of the Tauck Bridges program. 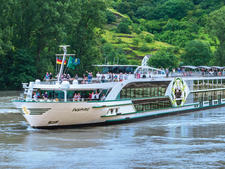 These sailings tend to be of the multigenerational variety, with grandparents, parents and children comprising the passenger base. Cruises occasionally draw passengers from other English-speaking regions, such as the United Kingdom, Australia, Canada and New Zealand. The daily dress code is casual and comfortable, as passengers will be visiting European cities and towns where they likely will do lots of walking -- on uneven surfaces in many areas. Passengers wear layers to account for weather swings, which might include chillier mornings, rainy days or hot afternoons. Laundry service, for a per-item fee, is available onboard. In the evening, the vibe is somewhat dressier, with a suggested "resort casual" dress code. Men wear slacks and button-down or collared shirts, while women wear slacks and blouses. T-shirts, jeans, flip-flops and sneakers are on the no-no list in the ship's main dining room, Compass Rose, in the evening. Passengers do not need to follow a dress code if dining at the ship's alternative restaurant, Arthur's. 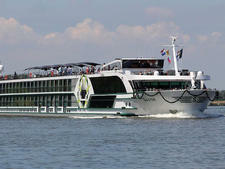 Emerald typically holds at least one gala night, where passengers are requested -- but not required -- to dress up. Most passengers elect to dress a little fancier, with men wearing jackets (though most skip the ties) and women adding dressier tops or wearing elegant pantsuits. 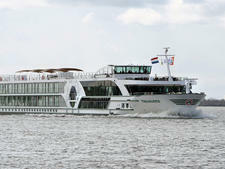 Occasionally, passengers will attend dinners on land, where the dress code is similar to what's worn on the gala night. Your cruise fare covers virtually everything on Emerald. That includes all gratuities (for crew, tour guides, hotel concierges and valets, and drivers), drinks (regional wines, beer and premium spirits), transportation to and from the airport, hotel and ship, shore excursions and Wi-Fi. You'll pay extra for spa treatments, which are reasonably priced and include gratuity for the therapist. Laundry services also are extra; you'll pay a per-item price, which ranges from about 2 to 8 euros, depending on the item. The euro is the ship's onboard currency.